Mount Nimba Strict Nature Reserve includes significant portions of Mount Nimba, a geographically unique area with a high number of endemic plant and animal species. These species include multiple types of duikers, big cats, civets, and several types of viviparous toads. It also has a population of chimpanzees using stones as tools. Mount Nimba is shared between Guinea, Ivory Coast and Liberia. The part of the latter country is excluded from the protected areas. The mountain reaches 1752m, and is part of a 40km long ridge. The Nature Reserve consists of high altitude grassland, plains savannah and primary forest including rain forest. The site has been in danger since 1992, since Guinea allowed mining for iron ore and because of the massive arrival of Liberian refugees. The area suffers also from lack of management, poaching and uncontrolled fires. I visited this site on Valentine's Day 1995. The weather was warm, sunny though hazy. I based myself in the nearby town of Lola in Guinea which is about 45kms from the border with Cote d'Ivoire. About 70% of the park lies in Guinea with the rest in Cote d'Ivoire. 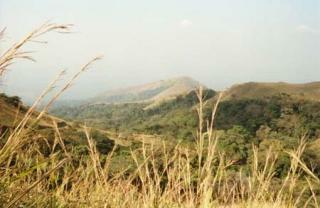 Mont Nimba and surrounding peaks straddle the border into Liberia as, in the best of possible worlds, would the park. However those areas within Liberia have been ravaged by bauxite mining. In Lola I stayed at the Savane Hotel and Dancing, no electricity, no hot water, no windows even in the bedrooms. Perhaps things are better now. In Lola, it is necessary to obtain, from M. Le Sous-Prefet, a permit to visit the park (easily done) and to hire a guide (hard to avoid) and a vehicle. I was found by Jeremie Coman, who described himself as Director of a research station in the park and at about 0845 we set off. We spent the whole day travelling thro' the park and I was able to see the 3 distinct vegetation zones (tropical forest, montane forest and a sort of alpine meadow) which changed as we got higher into the mountains. I saw a number of tumbling sparkling rivers and waterfalls, several natural bridges and possibly the biggest bamboo I've ever seen. What I did not see, though I was assured they do exist in the park, were chimpanzees making and using tools, and a type of toad which gestates for 9 months and then gives birth to 12-16 perfectly formed little toads. I also spent quite some time eating and drinking "raffia" wine with Jeremie's acquaintances in little villages in or near the park. Iron production: Site of 1 of the largest deposits of high grade iron ore ever discovered. In 1991 the Guinean government removed c 4500ha of the WHS which was wanted for Ore mining from the site boundaries saying it had been included "in error". WHC accepted this in order to preserve the integrity of the remainder. Nearby mining continues and threatens water purity in the WHS. Guinea gets funding partly for foregoing 50 million tons of Ore extraction.